DESTREHAN – New Sarpy Elementary second graders, Alex Ferguson and Jacob Galatas learn about Cub Scouts during a presentation by local scout leaders. 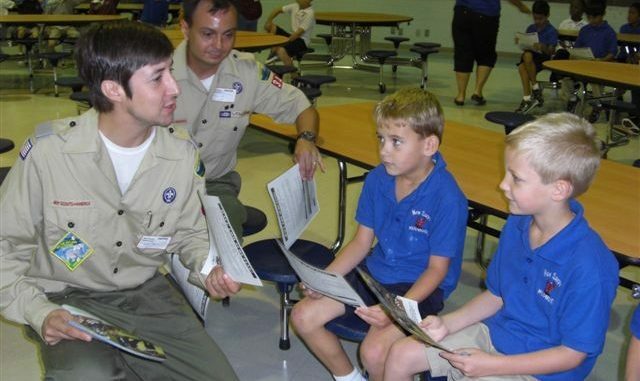 Boy Scouts of America currently has six Cub Scout packs in St. Charles Parish, serving over 150 boys with approximately 60 volunteers working to ensure boys in this community have a quality scouting experience. Every Fall, the Coy Scouts reach out to the surrounding communities through schools to recruit boys for Cub Scouts in grades first through fifth. Once joined, the boys learn traditional values with an emphasis on being physically fit, morally straight and mentally awake while having fun. Each Cub Scout is afforded the opportunity to participate in a variety of activities from camps to field trips to pinewood derby races to ensure the fun never ends.